The relationship between Savannah and County Wexford, Ireland that began at least 170 years ago is getting an update. The deep-rooted relationship started with Irish immigration as Wexford was the only place in Ireland where one could travel directly to Savannah. Many of Savannah’s Irish immigrants came from Wexford. Wexford and the Savannah region are now teaming up for a new phase of the relationship through business. 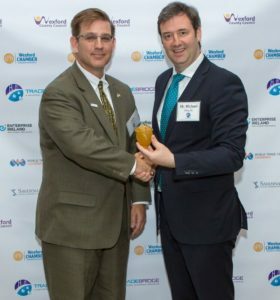 World Trade Center Savannah and the Savannah Development Authority are partnering with Wexford officials to start a pilot business development program, TradeBridge, designed to drive international trade and investment between the Savannah region and Ireland. Officials from Ireland, along with WTCSav and SEDA, announced the partnership Friday as Savannah’s St. Patrick’s Day celebrations were beginning. Bilateral trade between Ireland and the U.S. totals approximately $139 billion annually, WTCSav officials said. More than 700 U.S. companies have operations in Ireland, directly employing 155,000 people, while Irish businesses now employ more than 100,000 Americans in all 50 states. Some of Ireland’s leading firms, including Oldcastle and the Kerry Group, have operations in Savannah. A check with U.S. Trade online, shows that the Savannah district, which includes Brunswick and Atlanta, exported $140 million in goods to Ireland in 2017. Imports to our area from Ireland were $117million, also for 2017. Grant said as part of TradeBridge, both Wexford and WTCSav will be hiring a person for eight months that will be devoted to the program. “They will identify and facilitate trade opportunities for businesses from Wexford into the Savannah region, and possibly throughout the United States as well as from the Savannah region into Wexford, Ireland, and possibly throughout Europe for increased sales and overall business growth,” WTCSav officials said. Grant stressed that it isn’t just large businesses that are doing business internationally. Grant said that Georgia Development officials have said that 88 percent of businesses they have worked with for international trade have 100 employees or less. Howard Keeley, director of the Center for Irish Research and Teaching at Georgia Southern University, said Wexford is an “excellent door” into Ireland – and possibly the European Union.